Global warming is accelerating, as anticipated: the Arctic sea ice is the smallest ever for the season. Also the Polar Vortex wanders. As I have argued in the past, global warming also means, through equipartition of energy, great depressions, great high pressure, and great dynamics. Greats dynamics means great motions of whatever is big and can be moved. From depression, to wiggles in the jet streams, to the polar vortices themselves: whatever can move, will be moved. This has brought some counterintuitive effects: for decades, Antarctic sea ice spread out away from the icy continent, pushed by stronger winds. Also the accelerating melting of the giant Antarctic ice shelves (some 1,000 kilometers wide), has brought to the surface light sweet water, which readily freezes above the colder, denser saltier ocean water below. Thus climate deniers chuckled that Antarctica was getting colder, whereas, in truth, was they were observing was the exact opposite. So, year after year, the Antarctic sea ice spread out, and that was a shining demonstration of the global warming. Of course, this sort of evolution evolves steadily away from equilibrium, until things break, and a completely new attractive minimum comes within reach. This apparently just happened with Antarctica: after a year where the sea ice spread more than two standard deviations above the average, now the sea ice is shrinking two standard deviations BELOW the average. The Polar Vortex has wandered: for many weeks it was over Siberia. Instead of being around the North Pole. Thus the temperature at the Pole was 20 Celsius (roughly 40 F) ABOVE normal. Then the vortex went to North America last week, and temperatures plunged there. Now higher temperatures are again announced for the Pole. Ah, and what of this Saharan snow? Actually it was in an Algerian locality perched at 1078 meters above sea level in the Atlas mountains. It receives rain, and is surrounded by (thin) forest. 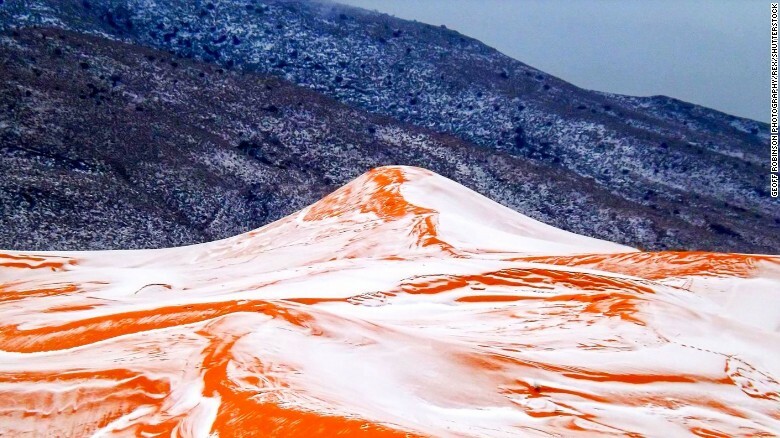 Although this particular locale had no snow for 37 years, it snows every year in the Atlas: Algeria has ski resorts. The Atlas culminate at 4167 meters in Morocco and stretches 2,500 kilometers (1,600 miles). Many peaks are above 4,000 meters, and the barrier is formidable. The Atlas actually creates the Sahara, as it blocks moisture from the Atlantic and Mediterranean to reach the interior of the continent (the Sierra Nevada does the same in North America, blocking much Pacific moisture). Two papers just published in Nature support my old opinion that the Greenland icecap is more fragile than it was previously assumed. These papers arose from collaborations from many prestigious institutions, in several countries, with support from the US National Science Foundation. It uses new radioactive techniques (new in that context). Basically, when exposed to the radiation of the natural environment, isotopic compositions get modified: elements become radioactive in specific ways; however, when tucked under kilometers of ice, said radiation does not reach the ground, and elements have a different isotopic composition; thus, scientists are now able to figure out what the ice cover was… even 7.5 million years ago. However, people on the ground, see the ice sheet retreating by miles, every year, in some places, leaving an eerie landscape behind. The other study in Nature was led by Joerg Schaefer of Lamont-Doherty Earth Observatory and Columbia University, looked at a small sample of bedrock from one location beneath the middle of the existing ice sheet. It came to what appears to be a contradictory conclusion: Greenland was nearly ice-free for at least 280,000 years during the middle Pleistocene — around 1.1 million years ago. This contradicts existing computer models: the Common Wisdom was that, after earth entered a period of glaciations 2.7 million years ago, camels disappeared from the High Arctic, and that was that. Both teams looked at isotopes within grains of quartz, produced when bedrock is bombarded by cosmic rays from space. The isotopes are created when rock is at or near Earth’s surface — but not when rock is buried under an overlying ice sheet. By looking at the ratio of two of these cosmic-ray-made elements — aluminum-26 and beryllium-10 caught in crystals of quartz, and measured in an accelerator mass spectrometer — the scientists calculated how long the rocks in their samples had been exposed to the sky, or covered by massive ice. The technique is not new, but was never applied before to cores from marine sediments. Now they are busy extending the methods to other places, including Antarctica. All of this will allow to evaluate better the probability of melting of the ice sheets in the present conditions. Well, Trump knows this (whatever he says to assuage his most clueless, suffering supporters). And thus Trump may do more than Obama, who did nothing, except covering up with hot air coming out of his mouth the black reality that the Federal government coal is sold at less than 20% of what it costs (according to a study published in Science in December 2016). 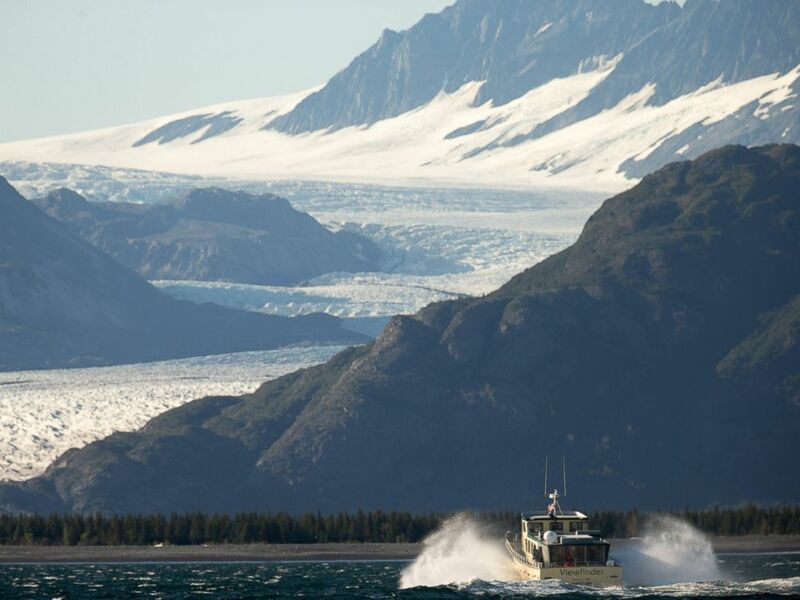 Now, in another orgasmic bout of hot air, Obama and Trudeau, less than a month from giving the reins to Trump, have barred drilling in the Arctic. Looks like Obama is suddenly waking up to the possibilities that being a US president brings. The moral thing to do is to be informed, and to look, in particular, at hypocrisy with a clear eye. Now Obama will be able to claim that he stopped the pipelines and the drilling. Zorro arrived at the last second to save the Earth, seven and a half year too late. History will laugh at how naive his (frantically hypocritical) admirers were. I went to a concert depicting climate change, past and future. Trust Californians to be innovative. The climate change had driven the composition of the music. Several of the musicians sat behind computers, three sat behind real instruments, one some sort of electric piano, the other two a bass guitar, and a violin. On the planetarium screen, one could see the Earth, and then, starting in the Eighteenth Century, three graphs: CO2 Parts Per Million, Land-sea Temperature Rise, and the Earth Watts per square meters imbalance. The, laudable, general idea is to put to music the drama of our destruction of the biosphere, and thus to make it more real to skeptics Americans. The USA is the general quarters of those who deny that burning fossil fuels is adverse to the health of the biosphere. The average American is deeply conservative, and does not perceive “climate change” as an urgent anxiety. However, the average American knows he, or she is supposed to feign interest, while going to buy its next truck. Tempo depended upon the CO2 concentration, pitch upon the Earth global temperature, distortion upon the energy balance on land in watts per square meter. The numbers used were past and anticipated. After 2015, the graphs became two: one was red, the bad case scenario, the other was blue, and represented the good scenario. As I looked at the blue graphs, the optimistic graphs, I got displeased: the blue CO2 emissions, the blue temperature, and the blue power imbalance, had a very sharp angle, just in 2016. First a sharp angle is mathematically impossible: as it is now, the curves of CO2, and temperature are smooth curves going up (on the appropriate time scale). It would require infinite acceleration, infinite force. Even if one stopped magically any human generated greenhouse gases emissions next week, the CO2 concentration would still be above 400 ppm (it is 404 ppm now). And it would stay this way for centuries. So temperature would still rise. The point is this: at 400ppm of CO2 (and nearly 500 ppm with the other man-made greenhouse gases) the atmosphere is being forced: more energy piles up in the lower atmosphere, and the temperature will rise, until the losses to outer space get progressively in balance with the forcing. If we stopped the CO2 emissions, magically, which is completely impossible, the CO2 would stay at 400ppm, the forcing would go on, and the temperature would still grow. The composer, who was on stage, had been advised by a senior climate scientist, a respectable gentleman with white hair, surrounded by a court, who got really shocked when I came boldly to him, and told him his blue graph was mathematically impossible. The silvered hair, tall and dignified senior climate scientist, told me, with consumed gravitas, that this was not the forum to address such concerns, and, anyway, he disagreed. I was expecting this sort of answer, and this is why I was fast and brutal, as composer and scientists, organizers, impresarios and plutocrats and the adoring public were thick about. As it turns out, it is the head of a new very important government laboratory. The Culprit: Distinguished Gentleman Bill Collins From Berkeley Was Seen Preaching to the Public That The Climate Catastrophe Can Stop On A Dime. Perfect Say The Fossil Fuel Plutocrats: We Will Stop On Dime Whenever We Want. And this is a mass murderous lie. When all wisdom can give is shock, shock wisdom shall give. The alternative being respectful silence… for infamy. Is there, indeed, a greater infamy than the disintegration of the biosphere in the name of American coal and SUVs? So what’s the game of these American scientists? Very simple: there were plutocrats in the audience, it was a fund-raiser. I was the only one to raise a ruckus, naturally. Everybody else was very admiring, in love. What did they admire so much? The truth is much more sinister. The supremacy of the USA does not just come from owning an entire temperate continent (after destroying the Natives). It also comes from oil, coal and gas. The USA has plenty of them, cheap and available. As Obama says all the time: “God willed it” (OK, he says: “God bless the USA”). The ongoing supremacy of the USA rests on oil, coal, and gas. This is why the Supreme Coal of the US, I mean, the Supreme Court of the US, just decided that burning coal was just, and so was bad air (and thus Obama’s Environmental Protection Agency crackdown on coal pollution was unjust, and should cease). American plutocrats are always one step ahead of the propaganda game. 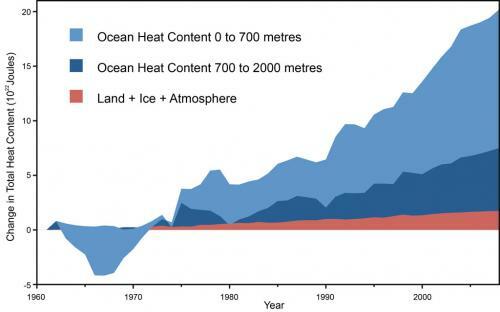 After spending decades claiming the Earth was not warming, now they are pretending, thanks to this impossible blue graph, that we stop the deleterious effects on the biosphere on a dime, should the USA want it. And the scientists are playing along… because they want the money. And the influence. And the plutocrats in the audience. And the American population confusedly feel that the USA is better off with cheap gas. As I explained, the Moral Imperative is to think correctly, and the first imperative of scientists should be to teach what is impossible. It’s impossible to stop the nefarious effects on the biosphere on a dime. There is huge inertia in the world climate and geophysics. Right now, climate change is happening at a rate 100,000 times the rate of the preceding great extinctions (they probably had to do with huge, sustained volcanism, direct from the core). In the best scenario of business as usual, most of energy from fossil fuels, we are on 4 degree Centigrade global warming scenario. And that means the poles will melt entirely. That will make the present Middle East disarray feel as if it had been a walk in a pleasant park. The climate crisis is accelerating (as anticipated): weird fluctuations of temperatures all over. It was colder than at the North Pole in many areas, 6,000 kilometers to the south. Some scientists contribute to the crisis by claiming that the Earth could be fixed by “geoengineering”. The idea is to make the atmosphere reflective above its lowest, and warmest layers. The prospect of salvational geoengineering gives a dangerous sense of hope, and enable cowards to change the conversation. The one and only conversation ought to be: how to reduce Greenhouse gases emissions before self-feeding natural processes take over, and the warming becomes not just non-linear, but self-amplifying. Above freezing, at the North Pole, in the last few days of 2015: enormous warm masses of air or water moving powerfully is how ice gets destroyed. Gregory Benford, astrophysicist and sci fi author is one of the advocates of the man-made volcano idea. See Climate controls, Reason Magazine, November 1997. In brief, one would spray a lot of micron-sized dust into the atmosphere above the Arctic Sea during the summer. Benford suggested diatomaceous earth as an option, because it’s chemically inert: just silica. Then, thinking again, Benford suggested poisonous gases: SO2 and H2S. What could go wrong? Apprentice sorcerers would sprinkle those poisons to diminish sunlight in summer (they say). Simulations by the naive, for the naive, show it may mitigate sea ice retreat. In reality, Polar hurricanes can shatter huge amounts of ice, while stuffing the Arctic for weeks with warm air, resulting in record sea ice loss. The spectacular shrinkage of the sea ice in August 2012 was caused by an extremely violent warm, hurricane like storm which physically broke thick ice with enormous waves. There is evidence that ice melting is not just due to a warm sunshine, but to the secondary paroxysms of massive dynamic and potential (pressure) events. Sprinkling a hurricane with SO2 won’t do a thing, one may as well throw sugar at a tempest to pacify it. When the Larsen B iceshelf in the Antarctica peninsula collapsed, something similar happened: four days of force one hurricane winds and a record high temperature of nearly 15 degrees centigrade (60 F). 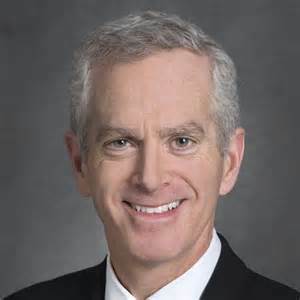 Benford was quoted approvingly even recently on his general train of ideas: “Many fear if we lose the sea ice in summer ocean currents may alter; nobody really knows”. May alter? Well, that’s obsolete: currents are changing and they are warmer. The naive idea that we have possible, feasible, potential geoengineering means to fight the melting of the polar ice. Delusion, illusion, obfuscation, prevarication, not to say fornication (with big oil). Trying to put up a veil over polar areas (through various debris or SO2 suspended) will not work. But don’t volcanoes work? The enormous eruptions of Pinatubo, and the one, much worse of Indonesia’s Tambora in 1815, cooled the atmosphere dramatically (Tambora’s atmospheric veil caused freezing the following summer in Europe, and partial failure of crops). The main problem is that the melting of the Arctic and even worse, the melting of the Antarctic, is going to happen from BELOW. Sneaky. It is oceanic water, densest at four degrees centigrades (nearly 40 degrees F) which is seeping below, and causing the melting. An article just published in Science (December 2015) explains that one particular, giant glacier has retreated by tens of kilometers, after being exposed to oceanic currents which are just ONE degree centigrade higher than the old normal, along the north-east tip of Greenland. Those currents are the return currents from the Gulf Stream extension which hit Spitzberg. Measurements and a back of the envelope computation shows that the anomalous heat content so far stored in the upper 750 meters of the world ocean is about twenty times that stored in the atmosphere… And the ocean is playing catch up (the temperature of this layer is up only half that of the atmosphere; deeper parts are also warming up). We are coming close to a tipping point on three giant basins in Antarctica (the WAIS, Aurora, and Wilke basins): oceanic water is boring through the sills there. After the sill, the basin slope down (under the weight of the ice), deeper than the Grand Canyon. The melting of each of these basins will rise sea level by seven meters. Conclusion: only the outlawing, ASAP, of the burning of fossil fuels will mitigate the catastrophe. Anything else, like Elementary School engineering suggestions, is a distraction from the task at hand: decarbonification. Engineering can work: modern nuclear energy, ever improving solar photovoltaic energy, and various storages, from dams, to molten salt tanks, to, of course hydrogen. A hydrogen electric car equipped with existing fuel cells, an 40 kilograms of compressed hydrogen, safely stored in tanks resisting to 700 Bars, thus, to any collision), could cross the entire USA, without refueling. This is exactly why the Obama administration yanked the research and deployment of those cars: otherwise pure electric vehicles and their abysmal small little range, would not have had a chance… Politics is a much twisted thing, but its Arianne thread is money… Such as the big money subtle corruption brings. Solar PhotoVoltaics could split water, and make hydrogen to store energy, of course. COP 21, Conference Of Plutocrats 21? The latest official scientific projections are more alarming than ever: a probability of at least a 4 Degrees Centigrades global rise in temperature by 2100 is greater than 55% (it’s in Science Magazine, November 27, 2015). And this dramatic prediction does not EVEN take into account the massive melting of the icecaps. I fully expect the dramatic melting of the icecaps, imminently, irreversibly, dramatically, and stupendously. Intuitively, just look at what is happening to Alpine, American, Andean glaciers: they are melting fast. That’s enabled by their smaller size… That means those with a larger size will melt just as well, it just takes more time to become obvious, that’s called inertia (I may write my details in an accompanying essay). The most striking feature is that we are adding 57 billion tons of Green House Gases at this point in CO2 EQUIVALENTS. So this does not just include CO2 emissions, but also NO, NO2 and CH4, plus chlorofluorocarbons. Some of these gases are 200 times, and sometimes thousands of times, more capable of the greenhouse effect than Carbon Dioxide. Propagandists who are keen, or paid, to underestimate the Green House Gas crisis, are keen to quote only CO2 emissions, and even then not those C)2 emissions due to fires, deforestation, cement making. This way they can quote “CO2 emissions” as low as 9 Gigatons per year, instead of the REAL number, which is nearly SIX times greater. The “infographics” above, agree with many of the points I made before. Some are well known scientific facts: CO2 will stay at high concentration for centuries (except if we find a way to extract it massively; we don’t have it now). Some are more philosophical: MUCH MORE FUNDAMENTAL RESEARCH IS NEEDED. There are two types of fundamental research: the applied type, say making (much) better batteries, or making controlled thermonuclear fusion viable as a new massive energy source. Then there is the really foundational fundamental type: that means supporting all and any fundamental science, from botany to astronomy: it is entangled with giving birth to new modes of thinking. Democracy, even Direct Democracy, the real thing, has to capped by government (in real direct democracy, the legislative framework is from the People). Even Bill Gates recently recognized the importance of government. Government is always the ultimate actor, “private” efforts are just a kindergarten. Water, including the ocean, is denser at FOUR degrees Centigrades (roughly 39 Fahrenheit, well above the melting point of ice of 32F!) So it will sneak below ANTARCTICA’s ice shelves, icecaps and glaciers. In some places, it ALREADY sneaks 800 kilometers below (500 miles, to use Roman units). When a few men and women rule over the fate of the biosphere, the astounding jewel of 5 billion years of evolution, they are automatically satanic. Helping the Earth is simple: switch off all fossil fuels subsidies, 6,000 billion dollars of them, per year. Converting that into research would solve ALL problems within 30 years. Doing otherwise is just dust bowls in the eyes. Instead, the COP 21 talks have been mostly about poor countries blackmailing the rich ones about 100 billion dollars (is that meant to be the price of the biosphere? Ten zeroes are missing…) That will solve nothing, quite the opposite, as it will reassure without a road to a real solution. Real solution can come only from radically new technology. We have a crisis way worse than Nazism onto us, and we are paying lip service to it. Just as the Nazis were financed by plutocrats (many, if not most, early on, not German!) the International Monetary Fund has revealed the immense of the global yearly total of fossil fuel subsidies — $5.3 trillion. This cludes the costs of the effects of energy use on people’s health (7 million dead a year from fossil fuel pollution! ), the environment and climate change. That’s 7 percent of the global gross domestic product. The OCDE counted more than 800 tricks the rich countries use to support the fossil fuel industry. Our great leaders pay lip service to “climate change” to look good, or, at least, less bad (yet leaders of the “V20”, the 20 Vulnerable nations presently disappearing under “climate change”, are sincere). Because our great leaders love themselves, and death, more than they love us, and life. And it cannot be otherwise, because of the way they got where they are, lying their way up, while having the greatest opinions of themselves, while anxious to please layers of plutocrats above them. (Notice the analogy with the Jihadists’ systems of motivations, thus explaining in part, why it took so long to discover that there was a problem with the State of Islamism, and its Islamist state). To end on a positive note: switching to cutting fossil fuel subsidies and making much more fundamental research could be started anytime, and by one, or a few countries, unilaterally. One could imagine President Donald Trump, suddenly feeling the heat, making an accord with Franco-Germania, and China, overnight. There is much more that can be done in the way of research and development. An example is Whistler’s Hydrogen Fuel Cells bus fleet, twenty vehicles, each with 200,000 kilometers. They produce no pollution, just water. The program was scrapped, just because it’s a bit more expensive than (subsidized) diesel buses, and because the extremely satanic Harper ruled over Canada . Instead, such a program should be made mandatory all over the West, and diesel buses scrapped, all over the West. Just do it. A scandal is surfacing at Princeton University, as the president and founder, Wilson, is found by the student body to be a racist. The official view on Wilson is that he was a saint, an apostle of peace, and the gentleman who, to his regret, had to intervene in World War One. My vision is the exact opposite. I have explained that Wilson, after he became president of the USA, and because he was a racist, encouraged the Kaiser and his top generals to attack the French Republic. So doing, Wilson invented the American policy of using fascist Germany to destroy the world, and, in particular the world order imposed by democratic European power. During World War One, American trade, with the active collaboration of the Netherlands enabled Germany to keep on fighting (otherwise the Franco-British blockade would have forced it into surrender within 18 months). Vast mounts have just been found in shallow seas off Siberia, some 1,000 meters across. They are probably caused by global warming, which is much more pronounced up north. ….these newly discovered subsea pingos may be quite recent. This lends support to another hypotheses, the one that states that mechanisms that form pingos on land and mechanisms that form mounds on the ocean floor are completely different. On land pingos are mainly formed when the water freezes into an ice core under soil, because of the chilling temperatures of permafrost. However, subsea pingos, may be formed because of the thawing of relict subsea permafrost and dissociation of methane rich gas hydrates. Gas hydrates are ice-like solids composed of among other things methane and water. They form and remain stable under a combination of low temperature and high pressure. In permafrost the temperatures are very low and gas hydrates are stable even under the low pressure, such as on shallow Arctic seas. Thawing of permafrost leads to temperature increases, which in turn leads to melting of gas hydrates, therefore, releasing the formerly trapped gas. “ The methane creates the necessary force that pushes the remaining frozen sediment layers upward, forming mounds.” says Serov. Subsea pingos can potentially blow out, without massive attention, as was the case with the highly visible Yamal craters, but with massive expulsions of methane into the ocean. For petroleum companies these areas may pose a geohazard. Drilling a hole into one of these subsea pingos, can be not only expensive but also catastrophic. During a geotechnical drilling in the close by Pechora Sea, an industry vessel unknowingly drilled a hole into one of these mounds. It triggered a massive release of gas that almost sunk the vessel. “We don´t know if the methane expelled from the subsea pingos reaches the atmosphere, but it is crucial that we observe and understand these processes better, especially in shallow areas, where the distance between the ocean floor and the atmosphere is short.” says Serov. Reference: “Methane release from pingo-like features across the South Kara Sea shelf, an area of thawing offshore permafrost”, Journal of Geophysical Research. Yes, the situation is serious. Even more serious than when American racist were supporting, enabling, instigating German racists, a century ago. Let no one say it was not clear. The racists failed, in their attempt to impose their order worldwide. However, the destruction of the biosphere, once it has gone too far, will be self-feeding. That’s what the tipping points are all about. The historian Gibbon viewed Rome under the Antonine emperors as the eternal city’s greatest century. So doing, Gibbon made the same mistake as all Roman thinkers we know of, made at the time. Rome, in truth, was a fascist military regime drunk with corruption. Gibbon lived in a similar, yet newer and improved, regime in Great Britain. Said improvements enabled Britain to established a spectacular empire. Because of the similarities with the plutocracy he flourished in, Gibbon could only sing the praises of Second Century Rome. If he had not sung them, nobody would know the book he wrote. Only a few people chosen by the fate of force took all the decisions in imperial, fascist Rome. Thus, unsurprisingly, those decisions were dumb. When Rome had been a Republic, many took the decisions, after huge debates. Thus they were excellent and Rome conquered the world. 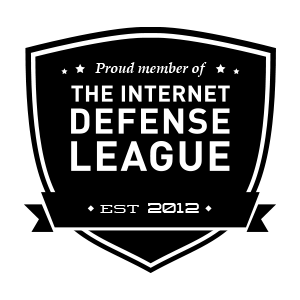 Nowadays, if we look at the bright side of things, we are not in such a bad position: the debates on the Internet may save us. Our clueless, corrupt and greedy leaders will not. Yet, if we look at the bad side, the situation is much worse. Rome declined because she was deranged, mentally sick, senile, the property of a few, physically sick, polluted, out of resources, out of her wits, out of time, riddled with corruption. Yet, these maladies were confined to Rome. The Barbarians, taught and inspired by Rome, were doing better all the time. Now the entire planet is threatened with a heart attack. 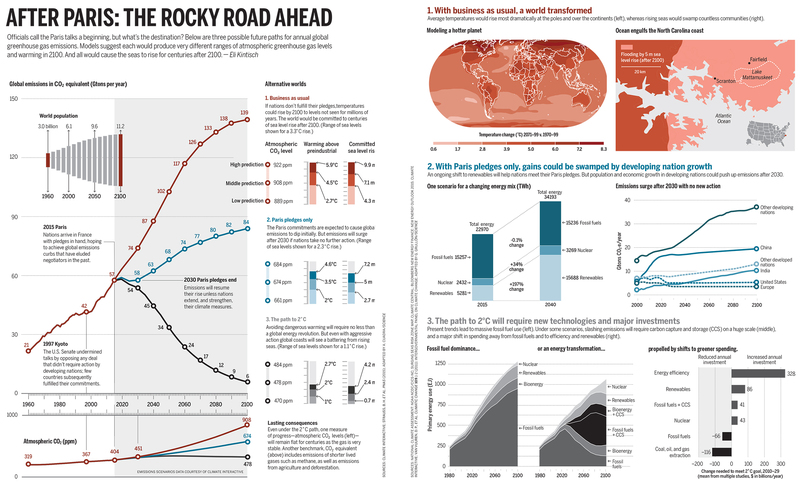 The planet’s biosphere is teetering on the verge of NONLINEARITY. Forget homeostasis. The weekly sea surface temperature reading, taken within the Niño 3.4 region near the equator, has risen to 2.8°C above average (that’s a rise of more than 5 degrees Fahrenheit). This ties the highest weekly departure of 2.8°C recorded in late November 1997 during the record-setting 1997-98 El Niño. Peaks five degrees Celsius above, and more, are observed (see graph above). Radiative forcing augmented by 36% since 1990. 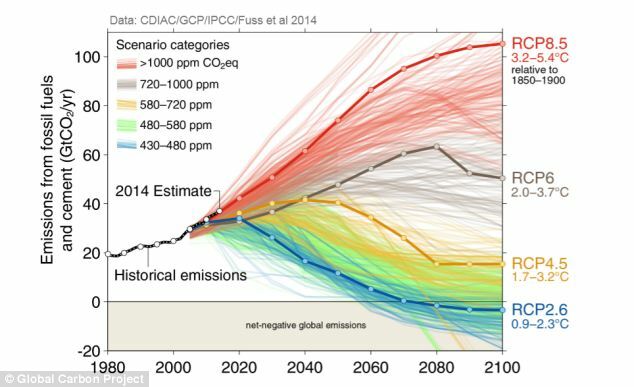 Moreover, CO2, CH4, N2O, all mighty greenhouse gases are beating records in 2015. The rising sea catastrophe is already upon us. In Senegal, the rivers Sine and Saloum mix, and form a delta. But the Atlantic ocean has been rising. So salt water rises occasionally higher than ever, invades, killing the African rice which feeds people, and even attacks the concrete, hence (extremely modest) houses collapse. Meanwhile unknown chemistry creates pollution fifty times above the UN limit in Chinese cities (China has correctly reacted by becoming the world’s first producer of solar energy).. Since the year 2000, every year but one, was warmer than the preceding one. The World Bank, not an institution known for revolutionary tendencies, came with a report predicting an augmentation of temperature during summer, in the Mediterranean, of NINE (9) Degree Celsius, by 2100. Why was the greenhouse problem not fixed yet? From a general mood of corruption. It was exposed in cyclism: because the USA is the largest market, a crook, Lance Amstrong was allowed to finish first seven Tour De France, although many knew of this drug enterprise. Soccer, of course, is pervaded by corruption. Corruption can be indirectly detected: in biking, French cyclists basically got no victory even on a single stage, for more than two decades, in the Tour de France. In France, drug controls have been very tough, for decades. Thus French athletes are at a disadvantage, because they are not doping (or, more exactly, not doping enough). Now it turns out that the obvious has been revealed: world athleticism is pervaded with corruption. The world athletic federation says that the London Olympics were “sabotaged” by doping. It points the finger at Russia, culprit of “State Doping”. How convenient. Well, that was obvious all along. There are nearly 200 countries, but only a few get most medals, and Russia is a prime offender. The federation proposed to exclude Russia from the next Olympic games. That’s obvious, and should be enforced. Russia is a corrupt state. But then what of states such as Great Britain, the USA and Jamaica? Did you look at their medal counts in London? Either those astounding countries are made out of super humans, or made out of super corruption: just like Russia’s their results in international competitions are just unbelievable, without systematic doping. The Federation did not say. Its acts are louder than words. The Federation just put Interpol and the… French Republic in charge of ferreting out this case of worldwide corruption in sports. Nietzsche, following others, notably Hinduism, believed in the “Eternal Return of the Same”. Nothing could be further from the truth: wherever we look, we see change. Even our sun is a second (or more) generation star. This means the Sun is (partly) metallic, and metals are crucial for life as we know it (or can imagine it). And even for creating a magnetically shielded Earth. Meanwhile in Israel, nearly 10% of Israeli Jews (more than 550,000) live in the so-called “Occupied Territories” which basically no nation, not even the Israel’s official poodle, USA, recognizes as belonging to Israel. Palestinian society is crisscrossed by Israel security services, to the point all what Palestinians can do is grab a knife… The colossal rage therein has not found a bridge to the “Islamist State”. All hell will break loose if it does. It is likely that glaciers will be gone from the Sierra Nevada within five years (except for the Palisade glacier, which may hold out a couple of years more). Evil is often born in the eye of the beholder. The Nazis found this out, the Israelis seem determined to find out. Yet, who can blame them? Greater forces are at work. And what is the empire of goodness to do? Well, stay in shape. In military shape. In 1914, and again in 1940, the forces of goodness were taken by surprise, and the catastrophe of a really full holocaust of civilization was barely avoided: don’t forget that, in the end, the Nazis wanted to kill everybody… Including the Germans. After all, this is the method Stalin used with the Soviets, chuckling all the way (at least, according to Winston Churchill who was there… and according to a little of interpolation of historical facts). The most troubling aspect of Stalin’s mass murdering, human rights exterminating ways, is that it was the only method which could defeat the Nazis. Having to choose between certain death and ignobility at the hand of Stalin’s “blocking sections”, and taking their chances fighting Nazis, Soviet soldiers naturally opted for the latter. The combination of climate warming and galloping demography is at work in Africa and the Levant. It’s a microcosmos of what will ambush all of humanity soon. One more reason to learn how to dominate it. It will require mental force, and then physical force to dominate the situation. Mental force will have to be considerable. Because we erred so long the wrong way, deliberately confusing civilization and abomination. So now we have abomination (Islamist state, Saudi Arabia, Putinistan, etc.) parroting civilization. 2) In the guise of “freeing” the people (that is, put them at the mercy of Wall Street/London supported dictators, from Morocco to Pakistan), European pseudo-intellectuals (Sartre, De Beauvoir and other collaborators, etc.) betrayed Europe and supported the USA plutocrats’ basic scheme (hiding their true purpose, taking their orders from Wall Street, below Marxist-Leninism mumbo-jumbo: who could have suspected anything?). 3) This has been, ultimately very bad not just for the Levant/Africa, but even for the USA, as it favored the rise of EVIL RULE (Pluto Cracy) there. As plutocracy rose, everything else went down, from the Middle Class, to freedom, economic and social opportunity, and the rate of scientific and technological progress. 4) Europeans are directly responsible, because, aside from yours truly, I have seen nobody bring forth this thesis. Instead collaborators such as De Beauvoir and Sartre were lionized, let alone comrade Stalin, and the now much reviled Kamerad Adolf. I agree many countries in Eastern Europe are racist, and that this is a moment of education for them. We should not hesitate to use force, starting with verbal force to make them understand that it’s high time to cut the racist crap. If they want to persist, help to the offenders (may Orban’s Hungary) ought to be suspended. There is probably at least ten million people in France, or the French diaspora, of recent total, or part African/Levant origin. Most, including yours truly, are perfectly integrated in Western civilization (having seen the alternative), and often more French than even an old racist like the Catholic chauvinistic fanatic, De Gaulle (tolerance is French, contemplate those who elected Julian in 358 CE, or Clovis, a century later Charles De Gaulle’s racism and bigotry was not French, it had to do with the “white race” and lack of esthetic taste such as detesting minarets). There is no return of the same. Yet, the progress accomplished is often less than imagined. It has definitively been established that Neolithic (“Prehistoric”) humans in Europe could perform limb amputation and trepanations. The prehistoric ones apparently mastered anti-septic, antibiotic and pain killing conditions enough to do so. We have progressed much. But not as much as we need. We need to progress much more, right away. Lest, of course, we prefer to live Israeli style, killing our fellow youth, just because it looks… Semite. The irony is impressive. The reason life survived on Earth for so long, and blossomed into animals, and now mind, is that the planet is equipped with homeostatic mechanisms (homeo means similar in Greek, and stasis, standing still). However, those mechanisms tend to be geological. Human civilization is now having an impact on the biosphere of a violence probably never seen before. The changes are faster than what geology, or even life, can accommodate. Some will brandish the impact of the Yucatan asteroid, and claim that was worse; however that’s just a theory: the biosphere was clearly under stress at the time from the Deccan Traps eruptions, and had been under that stress for hundreds of thousands of years, if not millions. At its worst, the Asteroid was just the straw which broke the Camel’s back. 2015 will be the warmest year since the end of the Eemian, 115,000 years ago. So why are record low temperatures appearing just south of Iceland? 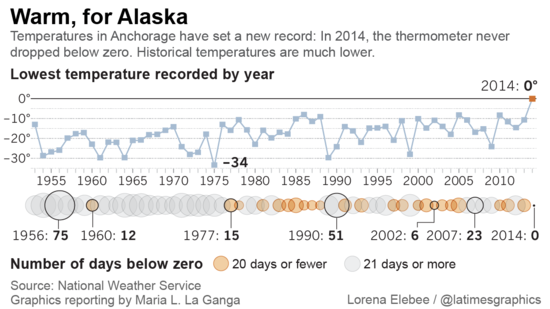 Yes, record lows, lower than ever recorded. While The Rest Of Planet Is At Record Warmth, Off Iceland, Record Colds Are Achieved! That was fully expected, and a demonstration of Non-Linearity of the incipient global warming. A phenomenon is linear when it looks like a line. Global warming is not going up like a line, as some places are warming at a rate ten times higher than the average, and some regions are cooling (and some are cooling spectacularly, off Iceland and some seas around Antarctica, for reasons related to warming). The Dryas events were extremely fast and pronounced cooling events which happened several times during the period 10,000 years to 15,000 Before Present. Some lasted around a millennium, others, just a century. They vanished as fast as they came. They are named after a tundra flower, the Dryas. In Scandinavia forests were replaced by tundra graced with Dryas (hence the name). In Britain, average temperature collapsed to minus 5 degree Celsius, and glaciers formed at elevation. These spastic events of drastic cooling, while, overall, de-glaciation was going on, long remained a mystery. Overall, the great glaciation which had brought glaciers down to New York, was on its way out, the planet was globally, irresistibly warming. So why would temperatures collapse in some places around Greenland by 15 degrees Celsius? The solution to the Dryas events’ spastic glaciation riddle? The same as always! Warming is non-linear. What’s the theory? The details are uncertain, but we know that the Gulf Stream (aka the North Atlantic “Conveyor”) shorted, literally: analyses of deep sea sediments have shown this. The conveyor sends an enormous current of warm tropical waters northward. When the warm tropical waters become very cold between Iceland and Spitzbergen, they sink to the bottom of the sea, and head south. 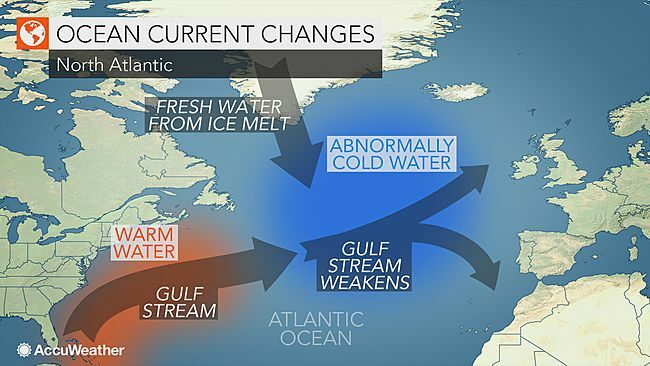 This sinking, plus the pushing by trade winds in the tropics, is what provides the energy of the Gulf Stream. However, if the warm tropical waters are capped by a very cold, but light sweet(er) water lid, they will get cold early, and sink before Iceland. This is what happened in the Dryas events. Nowadays a Dryas-like mechanism would have to rest on the melting of Greenland alone (that’s the only place with significant ice). This is, of course, insufficient, but summer 2015, cool and rainy over the northern North Atlantic is evidence that the effect is on. Scientific analysis confirms it. 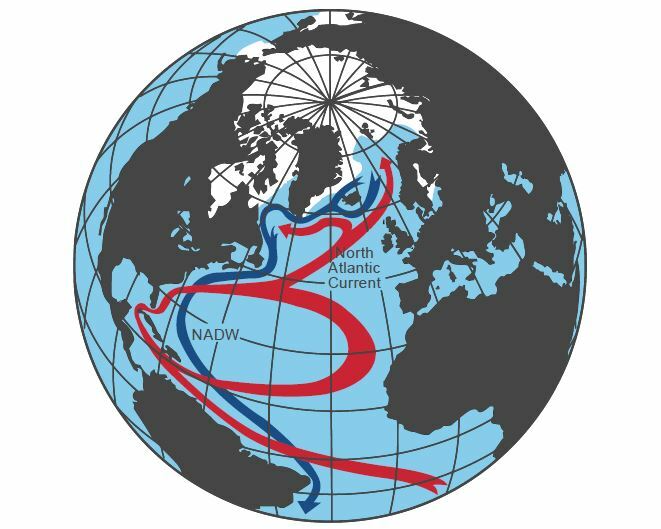 See: “Exceptional Twentieth Century Slow Down of Atlantic Ocean Overturning Circulation” (Nature, 23 March, 2015). The exact nature of what is going on at this point is a matter of debate among experts. What is sure is that something is going on. A similar situation beckons in Antarctica, where ice shield melting creates a freshwater lid all around which in turn freeze, extending the ice cap in the Austral winter. When considering nonlinearity, subtlety and surprises are of the essence. This is true in physics, as it is in psychology, history, or politics. And the morality in all this? The USA has played god. The European Union made a honest to goodness effort to reduce CO2 emission, while the USA, paying lip service to the opposite of what it was doing went right ahead, with its factory, the Plutocratic Republic of China, to use and abuse fossil fuels as never before. So now what? Is god still American, as usual? At first it seems so: the USA started to frack massively and massive amounts of fossil fuels were extracted from the USA’s generous soil. When American companies tried the same in Poland, it failed: the underground god (Pluto?) did not cooperate: Polish soil is adverse to fracking. Here comes the punchline: sea level has been rising fast along the Eastern seashore of the USA. Actually, three to four times faster than the world average. That’s more than one centimeter per year. Why? Imagine a traffic jam. Or rather a crash ahead: things come to a halt, cars, water piles up behind. Maybe the Washington politicians will soon have to learn to swim, and not just against the tide of world public opinion. The USA is going to be punished with its own instruments. Meanwhile 20 countries formed the V20, a group of twenty countries whose existence is immediately threatened by global warming, although they caused it not. 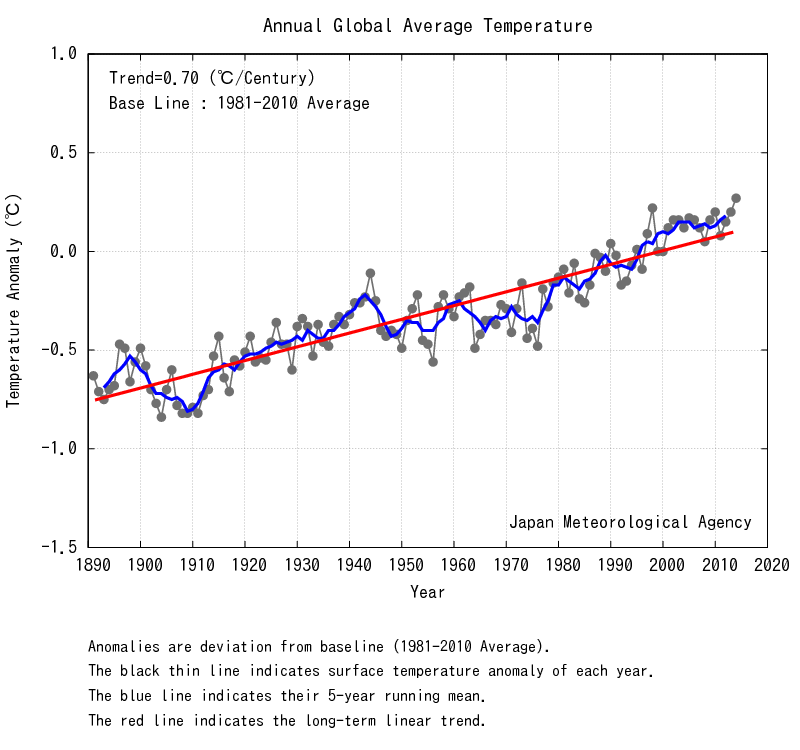 A Two Degree Celsius rise of temperature is indeed way too much: nonlinearity is upon us. Evil is always nonlinear. Obama went to Alaska and named Denali (the tall one in the local language) Denali. Denali, the tallest mountain that far north on Earth, is endowed with the tallest glaciated face anywhere on Earth, its north face being around 5,000 meters high (it had been named for a USA president who was killed by an anarchist, in those times when hatred for the mighty ran rampant). Naming Denali by its name needed to be done, and, in Obama was up to the task. Obama is best at demolishing open doors, when not pursuing the world terror assassination campaign by drones which does not just dishonor the West, but saps its foundations. (I am not saying I am hysterically against assassinations, torture, and that every assassination ordered by Obama is unwise. But the question of due process, excellent information, and perfect targeting is crucial; moreover, having a plan beyond imposing terror is paramount; not the case here). I personally have seen enormous glaciers which are now gone, both in Alaska, and in the Alps. Obama uttered many truths in Alaska. We know this method: drowning reality under a torrent of little truths, and common place truisms. Obama seems to have realized that he was the did-nothing prez. This is better than Clinton, who, having deregulated the banks, was the did-terrible prez, or Bush II, viewed by a sizable part of the world as a war criminal, for his invasion and destabilization of Mesopotamia. Yet, even Bush did something good, and durable: Medicare Part D. One can forget a bad man who did a big, good thing. Obama just put a band aid on the gangrene of USA health care, and did preciously nothing about anthropogenic climate change. At the Exit glacier, the president walked past signs that mark the year the glacier reached at that point. 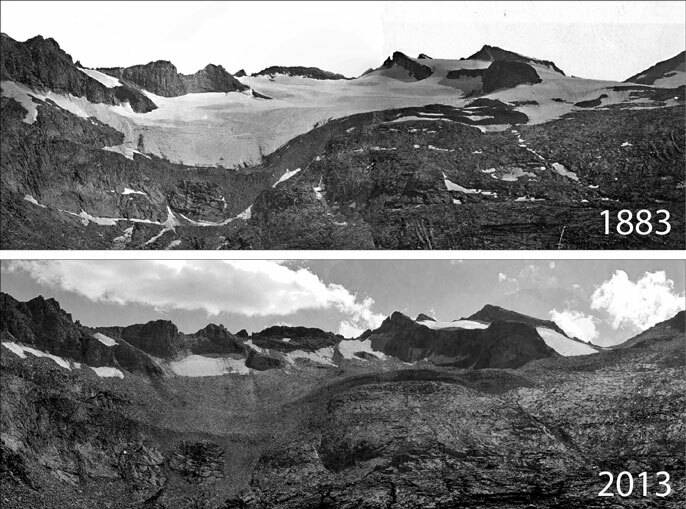 The glacier has receded two kilometers (1.25 mile) in the past 200 years. It is now the only glacier accessible by car and foot in the Kenai peninsula (which contains the largest icecap in the USA). This is slick disinformation. Grandkids? Are you kidding me? In truth, it’s absolutely certain that the grandkids will NOT see that glacier, except if the Obama daughters rush through the reproductive process. As I related in a preceding essay, a few years ago, I went back to Alaska, to show to my own toddler a giant glacier I remembered to be easily accessible by car and a little flat walk. I could not recognize the landscape: the glacier was completely gone, and had been replaced by tall trees. It was astounding. I was contemplating the same transformation of ice into trees this summer in the Alps. Going through a forest I had known as a formidable glacier. Obama is a Harvard lawyer. People around him are politicians (often also with a legal background), financial types, more lawyers, banksters (real or potential), conspiracy consultants, managers, celebrities, etc. So it is with most politicians around the world. Those people have little education in physics. One does not even know if they understand the basics involved in pushing a car. Apparently, they don’t. Push hard on a car without the hand brake, and it will not move much, if at all. Once I was in the Sierra Nevada, on a small road at 10,000 feet. California route 108, to be specific. Said road can get extremely windy and steep as it reaches Sonora Pass. It’s a trap: in the lower reaches route 108 is wide enough to accommodate the largest imaginable trucks. A truck driver armed with GPS had got his truck, a tractor-trailer, high enough to be unable to go back. Still hoping for the best, he forged ahead, until its giant vehicle was unable to take a hairpin, and, still hoping that brute force would solve everything, the driver succeeded to get completely across the road in two places, with many of its enormous wheels secured among very large boulders, both for the cab and the trailer. A large traffic jam ensued. As the closest imaginable rescue laid dozens of miles away, and going around, supposing one could back up, would require a detour of 200 kilometers (in the mountains! ), it was time to think creatively. While dozens of people were milling around, I noticed an imaginable path, by displacing boulders, and filling some gaps with stones. It helped that we were close to timberline, and trees were few. Getting to work with my spouse, we soon cleared and engineered enough of the land to pass through. Other vehicles followed. This little incident has nagged me for years: why did not the other drivers think about it? OK, my spouse and I have a maximal background in physics, but still, one is talking about basic common sense here. Why did no one else think of making a different road? Obama’s road, and that of the other politicians, from Cameron to Hollande, let alone Putin, or Xi, is to say what sounds good (Merkel may be an exception; but then she is a physics PhD too). It sounds good to speak about the “grandkids”: Commandant Cousteau started that one: save the planet for the grandkids. The ideas there are that the world ecology decays slowly under our assaults, and that it may be in our selfish interest to let it be, but nefarious within two generations. In other words: the future is slow. Our great leaders, the supremacists of self-endowed selfishness, just don’t have enough of a feeling for physics to understand climate change (once again with the possible exception of physicist Merkel, who has engaged Germany on a one-way trip to renewable energy… in a cloud of coal dust). INERTIA and MOMENTUM were discovered by Buridan a Fourteenth Century Parisian mathematician-physicist-philosopher-politician-academic (although the discovery is erroneously attributed to Newton, who blossomed 350 years later). Buridan had a gigantic following of students, including Albert of Saxony, Oresme, the Oxford Calculators. Those students used graphs (a world’s first), and demonstrated non-trivial theorems of calculus. Somehow, Aristotelian physics was as wrong as possible about dynamics. Aristotle and his clownish parrots believed that one needed a force to persist with motion, completely ignoring air resistance. Aristotle should have ridden a horse at a full gallop, and discover air resistance. If one believes in Aristotelian physics, there is no problem with the climate: just reduce the CO2, and the climate changes comes to a halt. Apparently our great leaders are at this level of education. Buridan gave the formula for momentum (which he called impetus): (MASS) X (VELOCITY). Given a constant force, impetus would augment proportionally to speed. This is what came to be called “Newton’s Second Law”. At this point human modification of the atmosphere, from stuffing it with CO2 and other gases, has made the lower atmosphere into a thicker blanket, imprisoning heat close to the ground. This is applying a constant heating force (aka thermal forcing) to the ground and the ocean, both of which are heating at increasing depth. The climate is the largest object, so far, on which humanity has applied force. The force applied is immense, the greatest force which humanity has ever exerted. Yet, because the climate is so massive, it takes much time to accelerate: the variation of climate change is low. Pushing the climate hard is similar, but much worse, than pushing an enormous object, say a truck: initially, it does not move. But when it does, it’s suicidal to try to stop it by standing in front. Can we stop applying the force? No. Not within existing technology. We cannot extract the excess CO2 in the atmosphere. Making plants grow to absorb the CO2 cannot work. First, recent studies on the Amazon show that present vegetation is not adapted to the present density of CO2. It grows faster, but then dies faster. Second, and most importantly, the mathematics don’t work. 1ppm ~ 2 Gt. 3 ppm: 6 Gt. Total CO2 atmosphere: 750 Gt. So CO2 augments by roughly 1% a year. Yet, total anthropogenic emissions are at least 35 Gt, and perhaps as much as 50Gt (a number I consider correct). So most of the CO2 from burning fossils disappears (probably in the ocean, where the reserves are of the order of 40,000 Gt; thus we are augmenting total carbon storage there by 1% in ten years; not dramatic, but the CO2 converts in carbonic acid, and the acidity is going up). In any case the excess carbon we send in the atmosphere is of the order of 7% of the total carbon in the atmosphere. We cannot neutralize this by growing plants: that would require to grow the biomass by 50Gt a year, 50 billion tons a year, year after year. A grotesque proposal. Even then, supposing we could miraculously stop the augmentation of concentration of CO2, under the present anthropogenic gazes concentration (around 450 ppm), we are well above the stage where all ice melts from the Arctic. So that is going to happen. In turn it will release further presently still frozen carbon storage, making it a increasingly non-linear augmentation (of the catastrophe). There is exactly one method that will stop the greenhouse madness, and it’s the simplest. Talking to no end about complicated schemes is diabolical, as even the Pope pointed out. Our present leaders will be judged severely by history. Not only they are dinosaurs, but they make sure that we are going back to the Jurassic all too soon. I will come back on the fact that somebody like Obama is so ignorant of the law (! ), that he does not even (seem to) know that one cannot “slander” someone dead (as he pretended one can… At the United Nations, when he equated not respecting a “prophet” with the murder of tens of millions). I will come back on the fact that “legal” tax cheating by the hyper rich, the plutocrats, has left all PUBLIC educational systems in disarray, and states weak. And thus this return to barbarity is pushing young people straight back to Medieval unreason (Rushdie). Since 1850, the Rise of Temperature Is More Than One Degree Celsius. For comparison, at the maximum of massive glaciations, say 22,000 years ago, when a mile high glacier stood above New York City, and a solid shelf of ice extended East, all the way to France, the temperature over the North Atlantic was just five degree Celsius lower… And sea level more than 100 meters below. An enormous acceleration, just as with the repression of Freedom of Expression. Charlie Hebdo and its many ancestors and its many predecessors operated without assassinations for two centuries. But now, for 15 years top cartoonists, journalists and writers in France have been under police protection… When they were not fired outright for criticizing some forms of Islamism.